Sizzling Kingfish Carpaccio: Hiramasa kingfish, flamed with extra virgin olive oil and drizzled with wasabi pepper sauce. Ask any Sydney foodie where to find modern Japanese cuisine in the city and you'll most likely get the response, Kobe Jones. Stylishly upmarket and situated on King Street Wharf, this contemporary restaurant is set for smart casual dining; the all-weather balcony allows you to soak up vibrant water views all year round, while chocolate toned furnishings, mood lit tables and delicate Oriental touches create an intimate ambiance indoors. 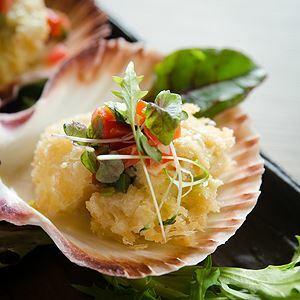 Japanese with a Californian twist is Kobe Jones' focus, expect to spot dishes on the menu like Alaskan crab croquettes with jalapeno salsa and tonkatsu sauce; or miso baby back pork ribs poached in sake and red wine, served with wasabi mash and pineapple chilli jam. There's also a concise, yet well thought out dessert menu; served with chocolate chopsticks. Kobe Jones's food is designed to bring the simplicity and beauty of Japanese cooking and meld it with nuances and surprising flavours of the west. Our chefs have created an array of flavours to suit every palate–for the first timer to the most adventurous diner we are often asked where our name comes from....well, Kobe is an ancient fishing village in Japan and Kobe beef is world famous, so Kobe was chosen as part of our name to represent the best of the Japanese food ethic epitomised by freshness and quality. Jones is a typical western name which represents the western influence and flavours in our dishes. This combination led us to the name Kobe Jones our teams in service and the kitchen hope you enjoy your experience at Kobe Jones and we invite your reviews and feedback, because you are the reason we exist! shared by three people we think the best way to dine is to choose from each section of the menu at two dishes per person. if there are just two of you, we have a special Perfect for 2 menu which lets you savour our complete range of flavours. Kobe Jones Sydney overlooking Cockle Bay offers the perfect combination oudoor and stylish interior surrounds for almost any event. Offering it famous Calforninan Japanese menu and teppanyaki options Kobe can certainly deliver an a unique experice Its two bars and 2 seprate entrances ensure total privacy and dedicated service that can be moulded to your every need.